For more than a decade Camden Goods Depot was the terminus for goods traffic. In 1851 the rail freight connection to London docks was made with the completion of the East and West India Docks and Birmingham Junction Railway, and this became the North London Railway (NLR) in 1853 and was realigned in 1854. The NLR at Camden Goods Depot has remained essentially unchanged since. The growth of mainline and suburban traffic has required periodic track additions and realignment, but these have taken place outside the main area of the Goods Depot, the area of which was therefore little affected by the railway for over 100 years from the middle of the 19th century to the end of the steam era in the 1960s. Vast quantities of material excavated from Primrose Hill Tunnel, from its 40 ft (12 m) deep approach cutting and from Camden Incline, predominantly blue London Clay, were used as fill in the Camden Depot area, between the Regent’s Canal, Gloucester Road (now Gloucester Avenue), the western edge of Stables Yard and Chalk Farm Lane (now Regent’s Park Road). This created a difference in level of up to 15 ft (4.5 m) between the “railway level” and the former ground level. The raising of land to the railway level was not only a practical way of using waste material from construction: it was required by the Regent’s Canal Company to carry the main line over the Regent’s Canal with sufficient height for the passage of barges. The difference in level was also created by vaults, generally erected to support various buildings at the level of the railway embankment, and carry their loads down to foundations in the natural ground. the height of the retaining wall along Chalk Farm Road at the intersection with the access road to Morrisons. 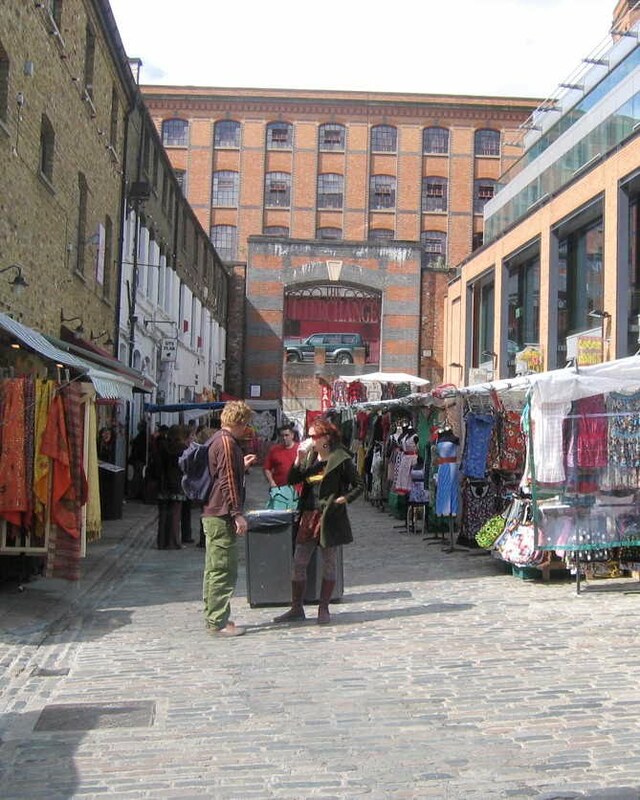 The area initially purchased from Lord Southampton was 25 acres (10 hectares) on the north side of the Regent's Canal. Considered unwarranted by many directors when proposed by Robert Stephenson, it soon proved inadequate. Further land was subsequently purchased on the south side of the canal and on the north bank between Southampton Bridge and the present roving bridge. These additions created a goods yard of about 33 acres (13 hectares). From the start of 1839 freight was hauled between London and Birmingham for Pickford & Co. and two other carriers that became forwarding agents for the L&BR. From 15 April that year similar services were offered to other firms. The Act specified that all locomotives and stationary engines should consume their smoke. Therefore coke, which burns cleanly, was used initially, produced by coke ovens on a site alongside the canal where coal could be delivered by barge. Only later, when firebox efficiency had been improved, could coal be used as a fuel. stores and a wagon repair shop. There were also cattle pens and offices. Vaults were created for the stationary winding engine house and the basement of the locomotive engine house. Other vaults were erected under the goods sidings and No. 1 Goods Shed, near the south-east corner of the site. Stables there were rented by Pickfords and other tenants by 1840. These goods sidings were constructed in the curious pinnate form shown in the plan above, with spur sidings branching out on either side of a "stem" at angles of about 60 degrees. The factors that dictated the reconstruction of the Goods Depot less than ten years after opening were firstly the rapid growth of passenger and goods traffic and secondly the increase in speed of passenger trains demanded by the public. This led to longer, more powerful, locomotives, whose extra length could not be accommodated in the original shed, a space now needed for the goods traffic. But the urgency of reconstruction was compounded by a collision on 29 July 1845 at Chalk Farm Bridge between an up passenger train and a goods train traversing across to the down line. The single fatality that resulted was highly publicised at the time. Planning of the new layout shown below was led by Robert Dockray as resident engineer. The passenger engine house, a rectangular building 400 ft (122 m) by 90 ft (27 m) complete with coking shed, coke store, offices, stores and fitters shop. Steam engines powered the workshop machinery and pumps for water supply, the water being pumped from an "artesian" well. Much altered over time, this shed survived until the end of the steam era in 1966. The goods engine house (the Roundhouse), a circular building 160 ft diameter, with 24 rail tracks, each sufficient for an engine and tender, radiating from a central turntable 36 ft (11 m) diameter, and carried on brick vaulting to the level of the rails, complete with similar coking facilities to the passenger engine house. A Construction Shop for repairing goods wagons, 435 ft (133 m) by 70 ft (21 m), also built by Gwyther & Branson, and consisting of carpenters’, smiths’ and fitters’ shops as well as offices. This building was brought up to the level of the rails on vaults which were used for stables and general stores. To make way for the Construction Shop, some of the lobe-shaped structures that had been built for spur sidings or possibly coal drops to the north-east of the original No. 1 Goods Shed were cleared away. Stabling for 427 horses including four freestanding stable ranges along Chalk Farm Road with stalls for an estimated 168 horses, the stables in the basement of Pickfords' warehouse on the canal and stabling in the vaults under the Construction Shop. A new bridge on Chalk Farm Lane to span 60 ft (18.3 m) across five rail tracks instead of the original two, allowing longer goods trains to be assembled with less risk of collision. Completed in March 1847, the bridge used early wrought-iron box girders to Robert Stephenson’s general design. It was the first such bridge he erected and may have been the first such bridge anywhere of a significant span. There was a 600 ft (183 m) long cattle landing area with pens near to the Roundhouse for live cattle that would then have been driven to Smithfield Market. The housing shown in the plan on the south side of the Hampstead Road was progressively purchased by the railway company and used for senior staff before being demolished as the goods yard expanded. Following arrangements made with the Regent’s Canal Company, the LNWR proceeded with the construction of an additional railway bridge between the Camden Goods Depot and the warehouse (Shed No. 2) south of the canal that had been built by Pickford & Co. and was now rented to Pickfords by the LNWR. The LNWR also enlarged the former Semple’s Wharf which had been first leased and then purchased in 1847. Railway communication with the wharf was created by means of a reversing spur. This was followed by the erection of a warehouse for Allsopp on the west side of the basin to accommodate the beer trade. The rail freight connection to London docks was not made until the completion of the East and West India Docks and Birmingham Junction Railway in 1851. The name was changed to the North London Railway (NLR) in 1853. 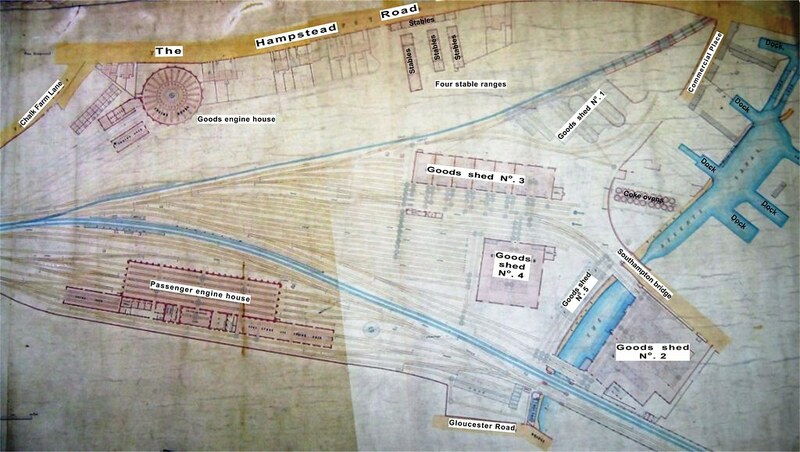 The tracks were aligned over the original goods sidings as shown in the plan, requiring the construction of a viaduct and the demolition of the railway offices as the line approached the bridge over the Hampstead Road. 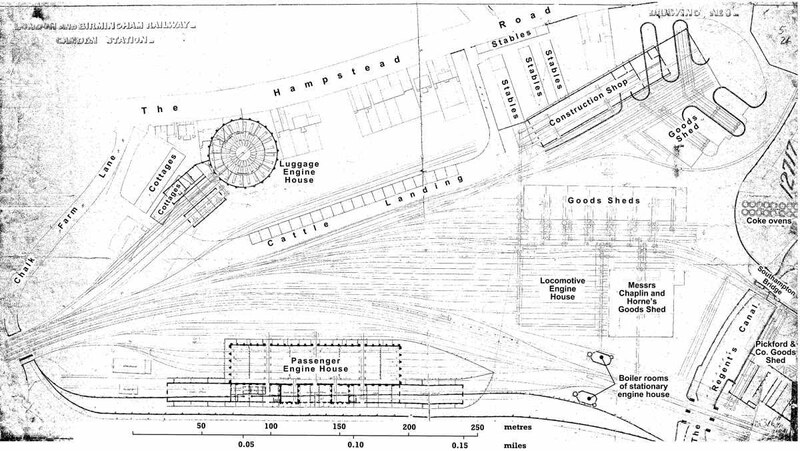 The skew arch that carried the NLR over the reversing spur to the LNWR interchange dock is shown in the plan, but the interchange facilities are not shown. In spite of the remodelling of the Goods Depot in 1847, the major increase in traffic that followed the reduction in tariffs for goods carriage two years earlier required a larger marshalling area. 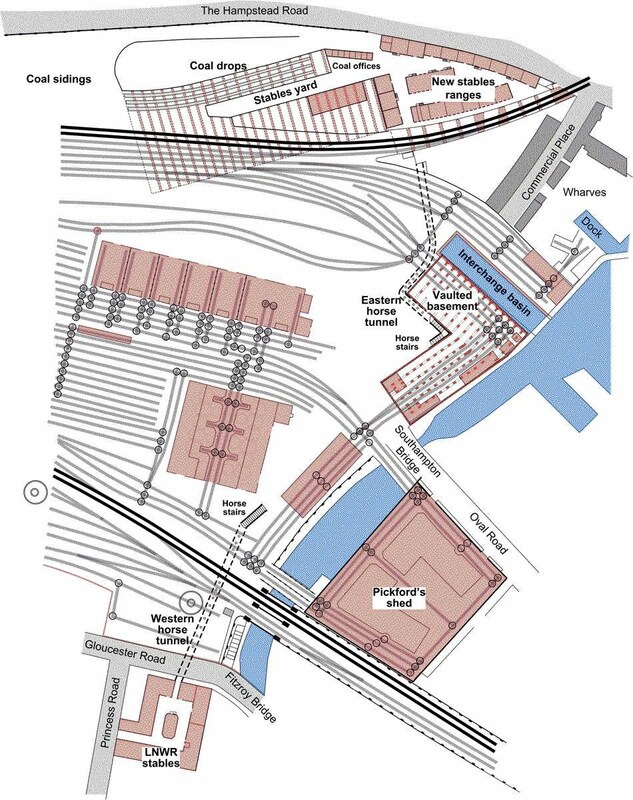 A radical replanning of the northern side of the goods yard was approved in 1854, and this included the repositioning of the NLR northwards, close to the Roundhouse, and the removal of the Construction Shop to make way for this. The Construction Shop was taken down and re-erected as a carriage shed at Euston. 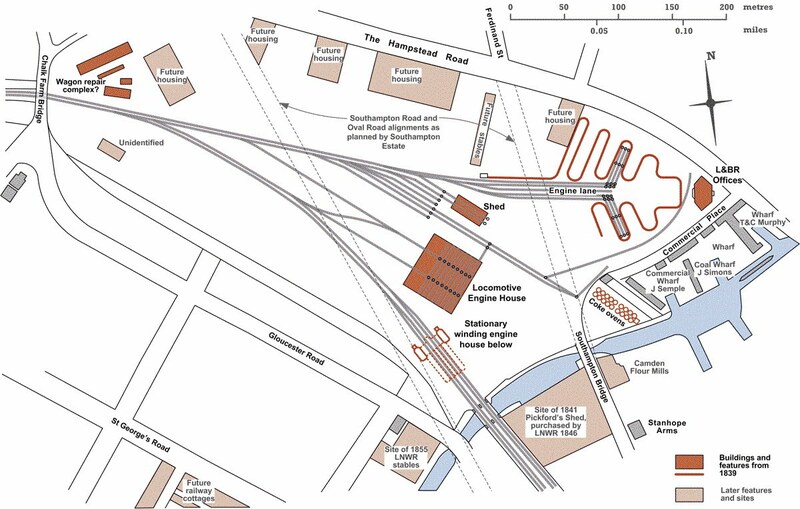 More drastic was the closure of the Roundhouse as an engine shed after less than ten years' use to avoid conflicts of movements adjoining the NLR and free up more space for the goods yard. The cattle pens were relocated to Maiden Lane on the NLR in time for the opening of the Caledonian Cattle Market in 1855, thus providing a ready access to the City. Houses alongside the Hampstead Road and ranges of stables that had been built only a few years previously were cleared away and the land up to the road east and west of the Roundhouse was raised to railway level behind a massive new retaining wall, with a road access ramp up from the east. This provided space for much needed coal sidings. Further sidings were provided to serve coal drops which stood in front of the 1847 vaults, separated from them by a stable yard. The vaults were used from the beginning for stabling and storage. The reconstruction of 1854-6 left space above the north-east corner of the 1847 vaults for a much smaller workshop, brick-built, 105 ft by 35 ft (32 m by 11 m), with roof trusses of queen-rod construction. This workshop building was converted in the 1880s, with an inserted floor, as part of Gilbey’s No. 4 Bond. It stood until the 1980s. The relocation of the NLR left an almond-shaped remnant of land between the road and the railway. The next phase of stables development took place both here in Stables Yard, with the building of four new stable ranges, and also on the south side of Gloucester Road. Horse tunnels were provided to link these stables with the goods yard. As part of the remodelling, the ground level adjacent to the canal interchange basin was raised, partly on vaults, to the main level of the goods yard, and railway lines extended at this high level towards the edge of the canal. The interchange basin was realigned and enlarged to its present size. West of the basin, vaults of similar construction to the earlier vaults supported another goods shed. These vaults were leased to Allsopps for storage of beers and ales. The arrangement was completed in 1856 and is shown above. The last quarter of the 19th century saw major changes to the content, if not the configuration, of the Goods Depot. Those changes associated with Gilbeys and stables development are described in other pages of the website. In 1864 the LNWR built a goods shed to replace several smaller scattered goods facilities. This had a plan area of 100,000 square feet and was the largest at that time in the country. It was further enlarged in 1931. By that time shunting with horses had largely been replaced by the use of hydraulic or electric capstans, while cartage operations had been nationalised under the railway company’s direct management and horses were being superseded by motor vehicles. In October 1866 there were 100 locomotives stationed at Camden: 33 passenger, 4 banking, 46 main line goods, 15 shunting, and 2 ballast engines, but it is not recorded if any of these were in the Roundhouse. 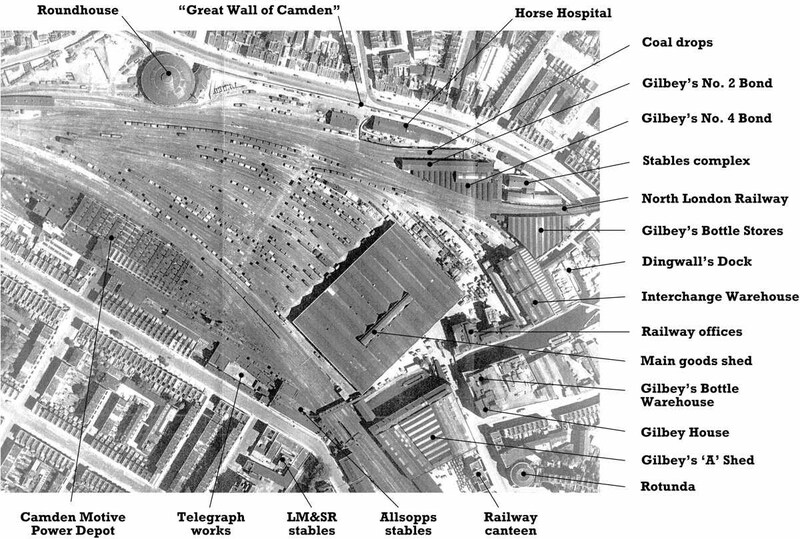 The layout of the Goods Depot from an aerial photograph taken in 1948 is shown below.